It is important to remember that good health is about preventive care. Omega-3 deficiency is on the rise and linked to many health issues. Since we are unable to naturally produce Omega-3 on our own, we have to rely on diet and supplementation to get an adequate amount of these essential fatty acids. 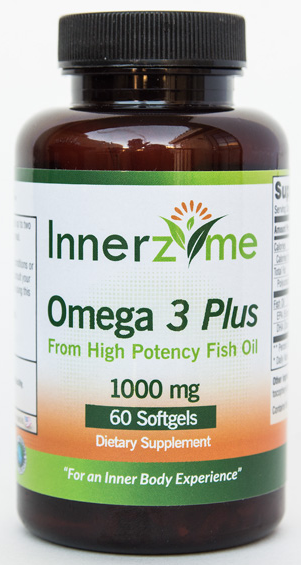 Innerzyme’s Omega 3 Plus – High Potency Fish Oil provides you with an optimal amount of EPA and DHA in a convenient, easy to swallow softgel. Other ingredients: Gelatin, glycerin, purified water, di-alpha tocopheryl acetate (to preserve freshness). Take 1 softgel up to two times daily, preferably with a meal.